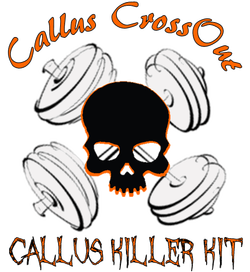 ﻿Callus CrossOut﻿ is available for wholesale prices to retail shops and gyms. Please complete our wholesale request form to find out more! Mild calluses: Use a small amount of Callus CrossOut after your workout and throughout the day to moisturize calluses and keep your hands and feet soft and moisturized. Moderate/Severe calluses: Callus CrossOut will help soothe your hands, but more significant calluses will need additional maintenance. Thick calluses will need to be gently removed so they don't crack or tear. Popular tools for callus removal include files, pumice stones or rasps. Pumice stones are better for mild to moderate calluses while moderate to severe calluses are best removed with a file or rasp. We've read of people using graters, razors or Dremel tools to remove calluses. We do not advocate these items for obvious reasons. 1) After soaking your hands or taking a shower use a pumice stone, file or rasp to remove the excess calluses. Don't overdo it! It's best to do a little at a time then take off too much in one sitting. Calluses are essentially dead skin so you shouldn't feel pain, significant discomfort or observe bleeding at any time. If you already have cracks you may feel some discomfort as the skin near the crack is moved, but the area being treated directly should not have pain. 2) Dry your hands with a towel and then apply a small amount of ﻿Callus CrossOut﻿. You do not need to wait until the skin is fully dry. Applying while the skin is damp will help trap moisture in your skin and aid in softening the callus. You can apply the balm to your entire hand, you do not need to restrict use to just the callus area. 3) Apply a small amount Callus CrossOut throughout the day as needed to keep hands soft. You will likely need to apply it less frequently once your calluses are under control. Note: You can apply Callus CrossOut wherever you have rough skin or want to moisturize. After applying to the calluses, rub in as you would any lotion or hand balm. 1) After soaking or in the shower, use a pumice stone, rasp or file to remove calluses and rough skin. 2) Dry your feet with a towel, leaving them slightly damp. 3) Apply Callus CrossOut liberally and then put on socks. Go to bed and wake up with noticeably happier feet!